Discover How to Quickly & Easily Open Your Own Audiobook Store & Send Your Internet Profits Skyrocketing! According to the latest statistics, more and more people are choosing to listen to good books rather than read them. It means now is the time for marketers like yourself to realize big profits by getting in on the ground floor of the exciting, fast-growing audiobook market! Thats right, if you have ever wished that you could add a new raging revenue stream to your current Internet business or create a new wildly profitable online business that takes practically no time at all to run each day you absolutely must continue reading this letter. -How to open your own highly profitable audiobook store in a mere matter of minutes! -The single easiest tool that you can use to take advantage of the booming audiobook industry and send your business profits soaring! -How you can offer a comprehensive selection of todays hottest, most in-demand audiobooks in absolutely no time at all! is Redefining the Notion of Reading! According to the Audio Publishers Association (APA), audio books are becoming popular because of their convenience and their high-perceived value. One of the chief benefits of audio books is that you can listen to them while doing other things such as commuting to work, waiting to pick up your children from an activity, working out at the gym, exercising at home, doing household chores, jogging, walking, driving, mowing the lawn or doing other outside work, at night while your partner sleeps (you wont keep them awake by having a light on), and much, much more! Due in part to this convenience factor, currently one in five U.S. households purchases at least one audiobook a year and that number is expected to rise dramatically in the future changing the landscape of reading in much the same way that digital music has reshaped the music industry. In fact, it wasnt very long ago that the thought of carrying around 10,000 songs, or a complete book, in your pocket seemed pretty silly. But now that more than 42 million iPods and 27 million MP3 players have been sold, the concept of taking music, or an audiobook, with you as you go out is as normal as walking out the front door with a credit card in your wallet! So dont miss out on whats being projected as the next big entertainment boom! 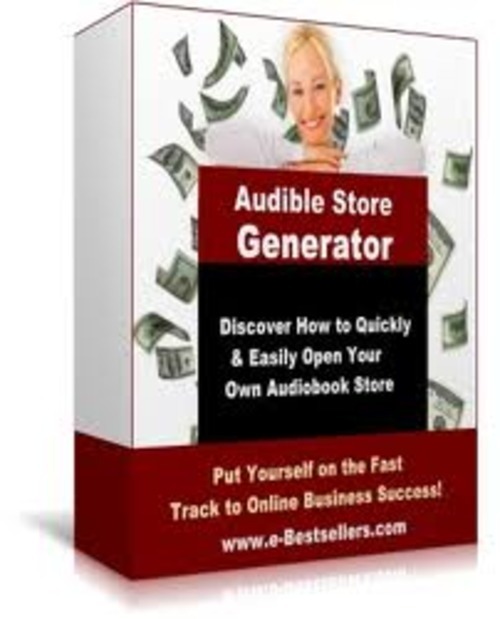 Get the tool you need to ensure you earn your share of the profits this booming industry produces get the Audible Store Generator software program today! Thanks to Audible Store Generator its never been easier to tap into the rapidly growing audiobook industry and generate huge cash profits! What is Audible Store Generator? Its a easy-to-install, simple-to-use software program that allows you to quickly add digital audiobooks to your existing website or create an entire store from scratch! In short, Audible Store Generator allows you to participate in the booming audio book phenomenon and reap huge cash profits without incurring any of the high start-up costs associated with this marketplace! Creates 20,000+ static HTML webpages (8,000+ products, 1+ HTML webpages per product, plus index pages)! Opens links in separate window so you dont lose the visitor! Easy to install and easy to use comes with pre-defined configuration file and complete instructions! Works on either your Linux server or your Windows PC computer! Boasts customizable templates to match the look-and-feel of your website andshopping cart! Compatible with https://www.tradebit.com script to use 50 less disk space on your webserver! Allows you to synchronize your store with https://www.tradebit.com products anytime! Downloads latest product datafeed files from https://www.tradebit.com and synchronizes it with your store! https://www.tradebit.com® is the Internets leading provider of spoken audio entertainment, information, and educational programming. Content from Audible is downloaded and played back on personal computers, CDs, or AudibleReady®mobile audio players. The company offers over 80,000 hours of audio programs from 270 content partners that include leading audiobook publishers, broadcasters, entertainers, magazine and newspaper publishers, podcasters, and business information providers.